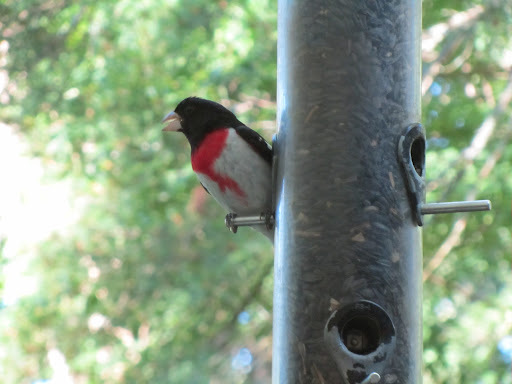 A rare and beautiful male Rose-Breasted Grosbeak visited our feeder last week during breakfast! He returned several times making us hope he’s nesting nearby. The dull brown speckled female was seen a few days ago, so maybe now she’s busy with her hatching duties. Hopefully we’ll soon get to see their progeny – which can be interesting if they’re males because they start off looking like the female and gradually change into the well-defined brilliant pattern you see above – all decked out for the Fourth of July! Yes, we have rare days of hot weather. No, we don’t have A/C. However, EVERY night the temperature goes into the 60s and we use fans to blow cool night air into the rooms. Our average high in July is 77 and our average low is 57. Highlands is a temperate rain forest and cloudy, rainy days keep things cool. For example, after a record hot day, a rainy night took the temp down to 61 and at 3pm the next day it was 76. That’s typical Highlands weather. With rare exceptions, our guests are amazed and pleased the first morning they awake on our beautiful shady hillside. Would you really want to spend your time in the mountains with the windows closed and the A/C running? 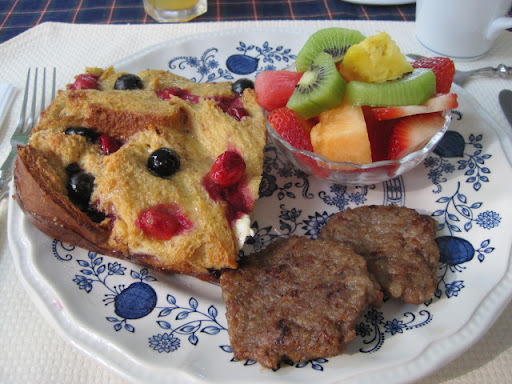 In fact, today was the first day this year the weather was warm enough to have breakfast on the porch, and we served “Red White & Blueberry French Toast” (fresh cranberries, fresh blueberries & cream cheese) served with Vermont maple syrup, fresh fruit and kicked up with Spicy Sausage. Thanks to Ed & Joanie for this great photo!! Arrive on Monday and receive Thursday night absolutely FREE! BBQ, Concert, & Fireworks on the Fourth. We’d love to be your hosts!